Gas Fittings - GAS IT Leisure Gas Bottles, Gas Cylincers and Gas Tanks - Catering, Motorhome, Campervan, Caravan, Farrier and Road Repair Refillable Gas Solutions. We are waiting for this item to at our warehouse. We currently estimate this item to be back in stock during the week of 20 Sep 2018. Delivery of this item would be after this date. 1/4" BSP FEMALE FIXED HEXAGON CONNECTOR. 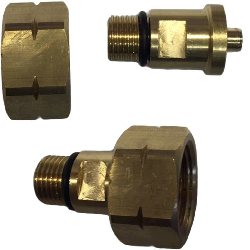 POL brass fittings are used for making connections in LPG systems. We are waiting for this item to at our warehouse. We currently estimate this item to be back in stock during the week of 05 Dec 2016. Delivery of this item would be after this date. We are waiting for this item to at our warehouse. We currently estimate this item to be back in stock during the week of 03 Jun 2016. Delivery of this item would be after this date.